We are packed to the gills and leaving later than anticipated on the first morning of our vacation! NO PROBLEM… we are heading to the beach so we roll with the over-packed car sitting in traffic, giving us plenty of time to think and remember that we managed to forget – the metal detector, our kite, the paddle ball game, and we didn’t pack beach chairs or a beach umbrella (another story for another time). Oh, we were off to a great start. Our amazing planning skills gave us a lot of time to sit on the Wright Memorial Bridge contemplating the fun in store during our two week stay at our semi-ocean front house in Duck. We arrived at the Duck Twiddy office where our keys were waiting for us (The Twiddy office runs like a well-oiled machine). We took off a few more miles north to our vacation home in the Carolina Dunes section of Duck, just past the research pier. Upon arrival at the house we saw a ground floor door, so we opened it and saw…..everything you could possibly need for your beach vacation – two heavy duty beach umbrellas, beach toys, about a dozen chairs, at least eight bikes and helmets, a windsurfer (we didn’t get a chance to be that adventurous) paddle ball equipment, badminton stuff, etc. Clearly the owners enjoy the beach and hope their guests do too. Now, we were really off to a great start! Up the stairs we went to the home’s entry way and the wonderful wrap around porch complete with wooden rocking chairs, built in benches and a porch swing. We found an awesome ocean view and a wonderful sea breeze. I didn’t want to leave and we hadn’t even gone in the house yet. The house interior was perfect for our group with an open floor plan on the main floor providing ocean views from the kitchen, dining area and living space. A bonus was a new large flat screen TV that wasn’t pictured in the online house photos. It’s always great when the house is better than you think it will be. We set-up camp on the top floor leaving lots of room for my parents who were joining us in week two. 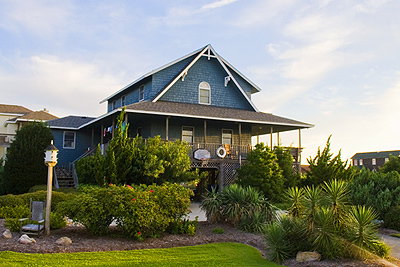 The house sits high up (for the Outer Banks) on a bluff covered with natural growth providing homes for many creatures. Over our stay we saw lots of different types of birds, including a hummingbird, a fox came out to see us a few times and we were visited by a green snake. The kids loved it and so did we. We unpacked as quickly as we could and headed down to the beach. This scene repeated just about every day of our stay as the weather was fantastic. One of the things we did for the first time this year was to buy swim vests for the kids. The surf ranged daily from incredibly rough to calm, glass like conditions and then back again, but the ocean floor dropped off quickly from shore making it a little tricky for our youngest two to play in waves. The kids actually loved the swim vests and we never had to remind them to put them on before heading out in the surf – even our ten year old who is a strong swimmer. I highly recommend them as they made our beach time a lot more enjoyable. With tons of great weather we spent time shelling, boogie boarding, sand castle making, piling up jelly fish on the beach, giant hole digging (don’t worry, we fill them back in before we leave each day) and sea glass finding – yes I found six pieces this year. In the evenings we took walks to the pier and back, surf cast, and flew our kite – thanks to the ocean front visitors who helped us untangle it from their deck. Will managed to slip out one morning for a plane ride and was able to take some fantastic aerial shots of the Banks. He also got a chance to visit a few of the site sponsors and say hello. One morning I headed out on a bike into Duck, grabbed a doughnut and ice coffee and enjoyed the quiet peace while looking out over the sound. I also went out a few times with the kids to do a little shopping in Duck and picked up another kite. Once my parents arrived, Will and I went out not once, but twice to visit other OBC members. Later in the week, we loaded up the kids and went to the aquarium in Manteo and toured the Manteo waterfront. Another morning I got a chance to finally beat my mom in tennis. I am still wondering if she let me win. Towards the end of our trip we realized there were so many things we didn’t do this year because we spent so much time on the beach. But honestly, the beach is the main attraction. On check-out day we followed our routine which involves leaving the house at 10:00 and heading to the Currituck Club. We walked all over the grounds, took lots of photos, watched other families catch crabs, toured the nature center and then headed to Timbuk II for lunch and a little shopping. By 2:00 we hit the road. Not once did we see any traffic making it back to Richmond in record time!! !